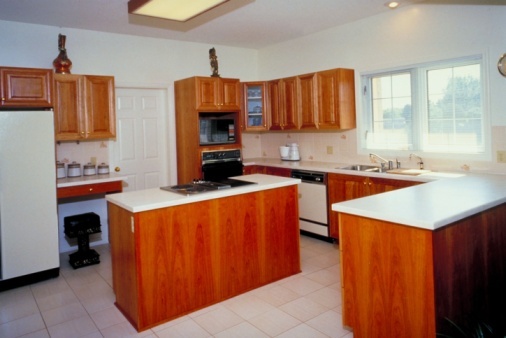 Bathroom vanity tops consist of many types of materials, including laminate, marble and granite, among others. Backsplashes typically reside along the back edge of the vanity to enhance the appearance and prevent water from seeping into the rear crack. When the left or right end of the vanity meets a wall, an additional side splash is required. Fitting and installing a side splash is almost identical to installing the backsplash, but the side piece is much shorter. Side splashes typically glue into place. Install the bathroom vanity completely per the manufacturer's instructions, if it is not already installed. Locate the side splash and position it on the side of the vanity, pushing it as far against the back and side walls as possible. 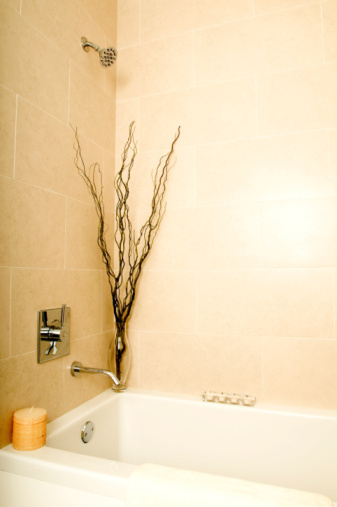 If you have a laminate side splash, ensure the finished end faces backward toward the wall or the vanity. 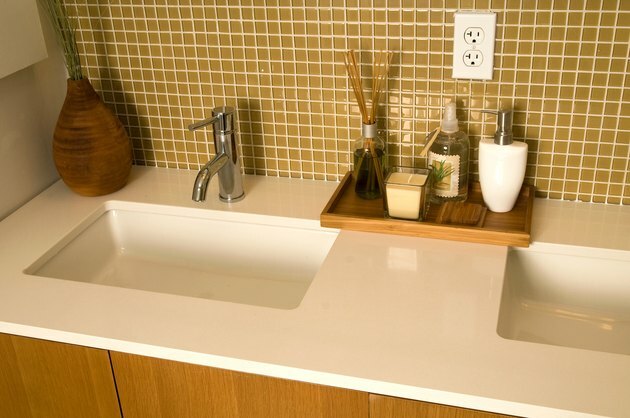 If your side splash is marble or granite, the polished end should face the wall or vanity. This allows you to draw a cut mark on the rear of the side splash so you don't cut off the finished portion. Draw a line on the inside edge of the side splash at the location where it meets the front edge of the vanity. Use a pencil or a dry-erase marker so you can remove the mark later. Put on safety glasses and cut the side splash material along the line using a circular saw if it is laminate. If the side splash is stone, such as marble, cut it using a diamond wet saw. Wipe the side splash clean with a damp cloth and then wipe the top surface of the vanity with the cloth to remove all dust and debris. Turn the side splash face down and apply urethane adhesive to the side that faces the wall using a circle pattern, which helps it adhere better. Apply an additional strip of urethane adhesive along the bottom edge that meets the vanity. Press the side splash back into place ensuring that the finished end faces forward. Immediately wipe up any adhesive that oozes out using the damp cloth. Wait until the adhesive dries and insert a tube of clear silicone or acrylic latex caulk into a caulk gun. Apply a 3/8-inch bead of clear silicone or acrylic latex caulk along the bottom edge of the side splash where it meets the vanity. Extend the caulk up the rear corner seam where the side splash and the back splash meet.